Slowly but surely we all start accumulating junk files on our Windows PC. A good portion of junk files are duplicate files. For users who work on office files or store lots of images this issue is very common. If you find yourself in such a problem, Duplicate Cleaner is the way ahead for you. 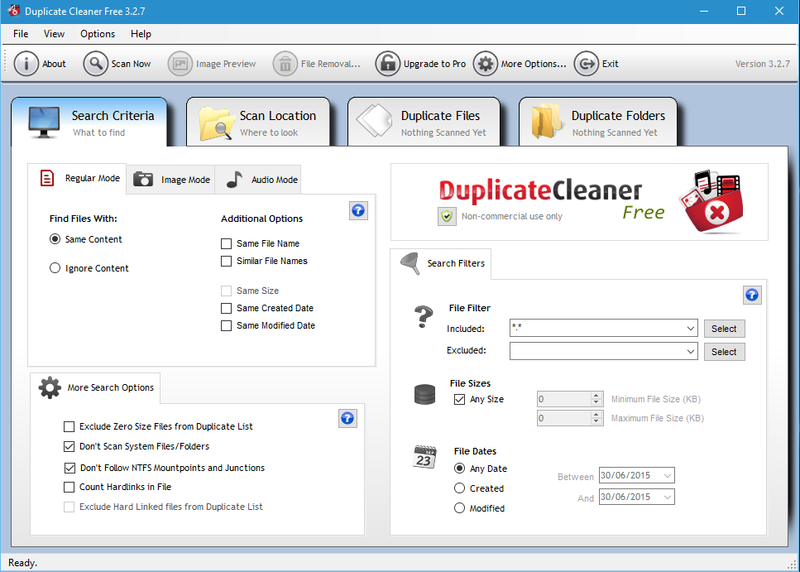 At the time of writing this review, Duplicate Cleaner is divided in two software. The pro version with all features is a paid software. One lower version with deprecated features is the free version. The free version is packed with features. But if you like it, buying the pro version is definitely an investment. Installation is pretty straight forward as it is a standard Windows OS EXE file. The options are simple for installation after you agree to the license agreement. The software installation places a shortcut on the Desktop for easy access. The opening screen can overwhelm first time users. That does not mean that the software itself is complex. But the way duplicate files are going to be found and dealt with is a complex process. 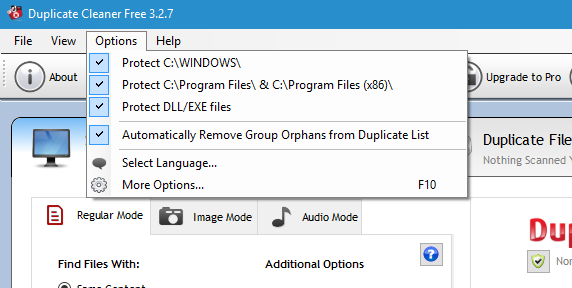 There are two primary ways the software is going to search for duplicate files on your PC. This option can be selected from the Regular Mode of Search Criteria tab. 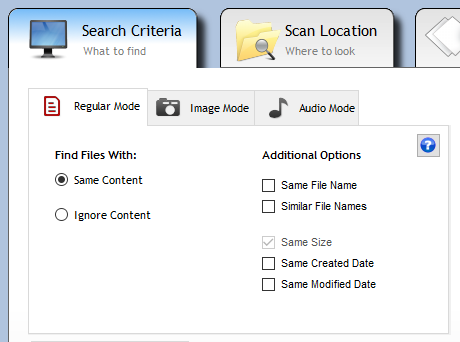 Image mode is a powerful search tool but is available only in Pro version while Music Mode searches for audio files. Only one of the modes, either Same Content or Ignore Content can be chosen. Same Content Same File Name. Only an exact name match with matching content is displayed in the duplicate search results. At the same time even Created Date and Modified Date can be set as search criteria. This is the safest form of searching and removing duplicates. Other option with Similar File Name is also safe since the content is matched and only then results are displayed. If you want ironclad safety, then ‘Ignore Content’ should be selected. This option removes the dependability on the software to match the content. Selection is now purely based on Filename and Date of creation. These are universal options set for all search options. In addition these options can be set for individual searches in More Options on the Front Screen. 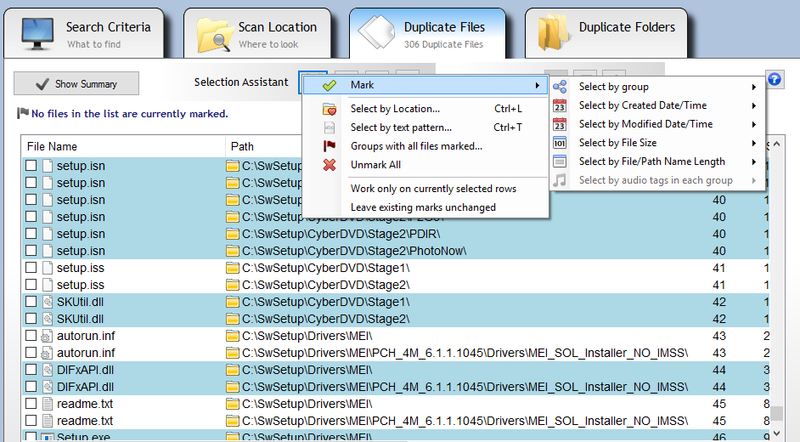 The second tab of Duplicate Cleaner enables you to carry out search for duplicate files in specific places or folders. This not only takes care of the issue of deleting important files by mistake, but also takes care of the safety of system files. This also enables scanning for duplicate files on an external media. Search results are also faster using this option. Choosing of a search location is mandatory to start a search. 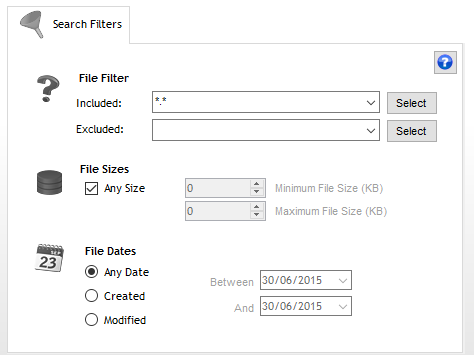 The deletion of duplicate files can be done manually or by use of a Selection assistant. The criteria for selection ranges from location, text pattern or groups. Make a proper section to enable correct deletion of files. 5 out of 5 stars for this only program Duplicate Files Deleter. Others are definitely not recommended. Try it to believe it. It deletes everything duplicate. Please use this program and nothing else & I am being serious.